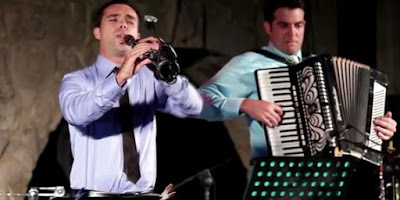 The Sound of Klezmer is an Israeli musical ensemble that includes soloist Maxim Solniker (clarinet), Omri Rivlin (accordion), Amir Kovalsky (keyboards), and Nir Segal (drums). This ensemble plays a purely Jewish soul music and it continues a long tradition. The ensemble often performs ceremonies, celebrations and festivals throughout Israel and the world. The soloist is a student of clarinetist Giora Feidman, two of the band members are graduates of the IDF band, and the fourth is a musician and arranger. In this video The Sound of Klezmer plays a rousing version of Adon Olam that you're not likely to hear in your synagogue tomorrow, but it gets us into a freilach mood for Shabbat.